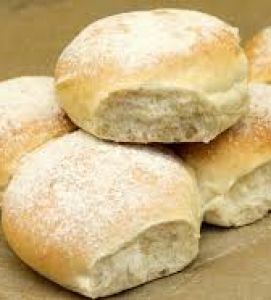 Freshly baked soft bread roll, wonderful with generous amount of butter for a real treat. With your fingers, mix the white flour, salt and dried yeast in a bowl. Rub the softened butter or lard into the flour mixture until the mixture resembles breadcrumbs. Mix the warm milk with the water. Add the milk mixture to the flour mixture and mix together with your hands until the dough is well combined. Bring the dough together into a ball. Using floured hands, knead the dough on a clean, floured work surface for 20-25 minutes, or until the dough is elastic and smooth. If necessary add a little more warm water to loosen the dough. Return the dough to the bowl and cover with a clean damp tea towel or cling film. Set aside for 1-1½ hours in a warm place until the dough has doubled in size. When the dough has risen, return it to a floured work surface and knock it back. Separate the mixture into eight parts and roll each into a ball. Flatten each slightly with the palm of your hand and transfer the rolls to a baking tray, placing them close together. Cover the tray with cling film and set aside for another hour, or until the rolls have doubled in size again. Meanwhile, preheat the oven to 220C/425F/Gas 7. When the rolls have expanded, dust them with the rice flour and transfer them to the oven. Bake for 8-10 minutes, or until golden-brown and cooked through. To serve, separate the rolls and serve warm with butter.